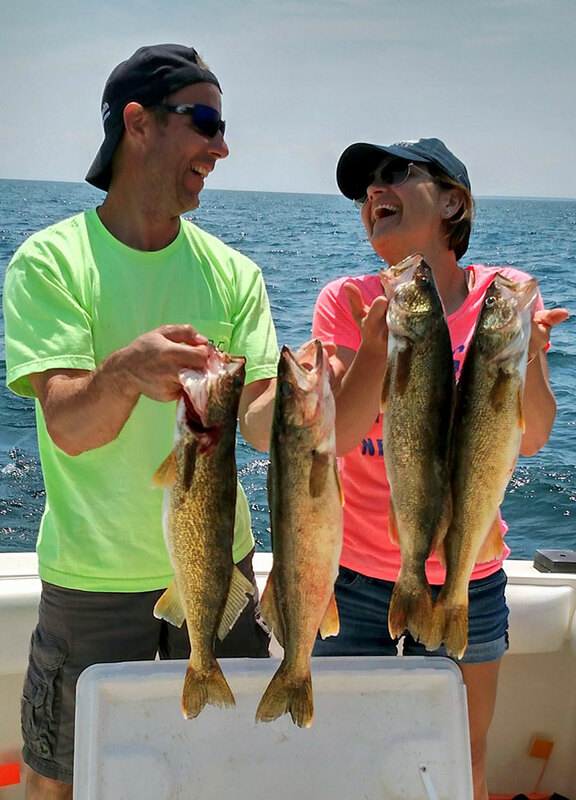 Saginaw Bay walleye are still being caught at a variety of locations including 18 to 24 feet off Pinconning and Gambil’s Marina, 18 feet off Linwood, the Red Spark Plug (Buoys 11 & 12), north of Buoys 1 & 2 which is the Green Spark Plug, the Slot from Quanicassee to North Island in 7 to 11 feet. Crawler harnesses in all the usual colors continue to be the go-to bait as well as blue and silver crank baits. Shore fishing at all locations was generally slow with only a few bass, freshwater drum, and catfish taken. Water temperatures at Caseville were hovering around 59 degrees which sharply curtailed success but walleye were still caught north of the Charity Islands and off Oak Point. Au Gres Area water temperatures dropped because of prevailing winds however those trolling were still taking good catches of walleye straight off the mouth of the Au Gres River and south of Pointe Au Gres off the Rifle Bar in 10 to 20 feet. Look for areas of warm water and you will find active fish. Grindstone City had very good walleye fishing however a shift in the wind dropped lake temperature by 7 degrees. Anglers were working hard to find fish. The same pattern is making it hard for salmon and trout anglers because the thermocline was so far offshore. Oscoda boat anglers had decent results for lake trout, steelhead and the odd salmon. Most were dropping lines in 75 feet and working their way out in the morning. In the evening, reverse and follow the fish into shallow waters. Lake trout are hitting on dark colors in the bottom 20 feet. Steelhead are on the scum lines and staying up high. Au Sable River walleye are still making their way into the river in good numbers. Crawlers, leeches and stick baits are working well early or late. 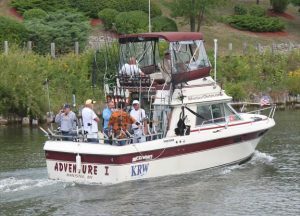 Port Austin had excellent walleye fishing east to Grindstone City and around to Lighthouse Park in 30 to 40 feet. Spoons and crawler harnesses took fish in the 3 to 5 pound range. Recent weather patterns pushed in warm water along the tip of the Thumb and that may have fueled the bite. Walleye fishing to the west of the port was not good because of cold water. Tawas Area pier and river fishing were slow with only a few smallmouth bass, rock bass, freshwater drum and small perch caught. Boats trolling outside Buoy #2 caught steelhead off the surface and down to about 20 feet in waters 35 to 50 feet deep. 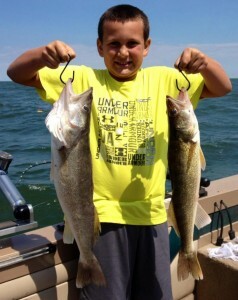 A few walleyes were also caught. A couple of boats perch fishing along the weed beds off Jerry’s Marina caught a fair number of fish ranging 6 to 10 inches. A good number of walleye boats continue to head south to the Charity Islands.